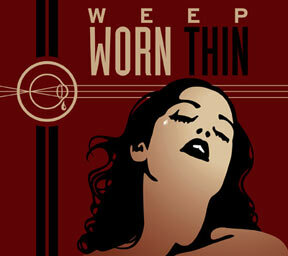 Worn Thin, the first full-length from NYC’s WEEP, takes their aggressive and firmly pop-structured songs to a place of heightened grandeur. 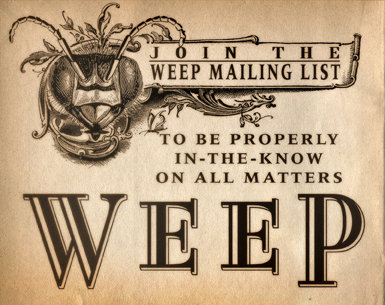 Sweeping choruses, horn-driven verses, and lush production work seamlessly with WEEP’s guitar and drum-driven sound. At times the listener is reminded of The Head On The Door-era Cure enjoying the strange bedfellow of Catherine Wheel or Placebo. WEEP’s pilot, Doc Hammer (incidentally the same Doc Hammer who co-created Cartoon Network’s The Venture Bros.), brings his uniquely raspy vocals to the front on this release creating a bizarre but not unfamiliar kind of New Dark Pop. Songs like “Snow Scenery” and “The Time I Thought That” are almost radio-friendly guitar powered hits, aggressive in their approach to song-writing and performance. While songs like “Calm Down” and “Over Now” take that same approach and push it to dramatic and lush heights that the “radio” will never be comfortable with. CD in EcoWallet with Booklet.